Objective We investigated the impact of cardioprotective drugs on ST-elevation, arrhythmias and infarct size in a rat model of repetitive coronary artery occlusion. Methods Seventy Sprague-Dawley rats were randomised to two control and five treatment groups. Placebo was either implantation of a pneumatic occluder onto the left anterior descending coronary artery (LAD) without starting repetitive occlusion (SHAM) or subsequent RO of the LAD over 10 days without medication (ROP). Treatment groups underwent RO and additionally received nitroglycerin (NTG), metoprolol, verapamil (VER), ranolazine (RAN) or candesartan (CAN). Two weeks after the intervention, rats underwent a single, sustained LAD occlusion followed by reperfusion. To evaluate differences in cardiac resistance against myocardial ischaemia and reperfusion injury, cardiac surrogate parameters including maximal ST-elevation, arrhythmias and infarct size were assessed. Results Compared with sham, RO alone and RO plus nitroglycerin were associated with significantly lower maximal ST-elevation and percentage of infarcted myocardium (SHAM 0.12 mV, ROP 0.06 mV (p=0.004), NTG 0.05 mV (p=0.005); SHAM 16.2%, ROP 6.6% (p=0.008), NTG 5.9% (p=0.006). Compared with RO alone, RO plus RAN was accompanied by increased ST-elevation (0.13 mV, p=0.018) and RO plusVER or CAN by more infarcted myocardium (14.2%, p=0.004% and 15.5%, p=0.003, respectively). Rats treated with VER, RAN or CAN tended to severe arrhythmias more frequently than those of the control groups. Conclusions RO led to an increased myocardial resistance against ischaemia and reperfusion injury. Concomitant administration of nitroglycerin did not affect the efficacy of RO. Cardiovascular channel or receptor blockers reduced the efficacy of RO. Coronary collateralisation, occurring particularly in the presence of coronary artery disease (CAD), is considered protective in the case of myocardial infarction. Ischaemic preconditioning increases arteriogenesis in rats and rabbits. In this study on ischaemia-induced and reperfusion-induced injury, we found that the most widely used cardioprotective drugs in CAD unfavourably impacted the cardiac outcomes in rats after ischaemic preconditioning. Care should be taken in the selection of cardioprotective drugs. Further research in experimental and clinical settings is necessary to elucidate the impact of concomitant medication on clinical outcomes. The rate of coronary artery disease (CAD) has declined during the first decade of the 21st century.1 However, myocardial infarction remains a possibly fatal consequence. Coronary collateralisation, occurring particularly in the presence of CAD with repeat episodes of angina, is considered protective in the case of myocardial infarction. Sustained perfusion of ischaemic tissue by coronary anastomoses reduces ST-elevation, fatal arrhythmias, infarct size and mortality.2–5 Therefore, therapeutic promotion as well as prevention of impairment of collateral growth and signal pathways of myocardial preconditioning may improve survival from myocardial infarction. Patients with CAD most frequently are treated with antianginal or antihypertensive drugs. However, little is known whether and how these medications interact with cardioprotective signal pathways and myocardial arteriogenesis. A previous study on a rat model of repetitive myocardial ischaemia showed an increased collateral-dependent flow after completion of a 10-day repetitive coronary artery occlusion (RO) protocol compared with sham treatment.10 Based on this finding, the objective of this study was to assess whether different cardiovascular medications in addition to RO affect cardiac resistance indicated by improved functional and structural cardiac outcomes. In a model of repetitive myocardial ischaemia, male Sprague-Dawley rats, aged 10–12 weeks, underwent repetitive occlusion (RO) of the left anterior descending coronary artery (LAD) to stimulate myocardial arteriogenesis. For this purpose, a pneumatic mini-occluder was implanted under general anaesthesia and postprocedural analgesia as described before.10 RO started 3 days after implantation of the occluder onto the heart at the level of the mid to proximal LAD. RO-induced recurrent myocardial ischaemia was induced by automated compression of the LAD three times a day for 10 days. One 40 s occlusion was performed every 20 min for 2 hours 20 min, followed by 5 hours 40 min of rest (figure 1A,B). From the second day after implantation of the occluder and, in parallel with RO over a period of 10 days, the animals received cardiovascular drugs or placebo. Study flow chart. Repetitive occlusion protocol (ROP) (A, B) and study setup (C). CAN, candesartan group; MET, metoprolol group; NTG. nitroglycerin group; RAN, ranolazine group; ROP, repetitive occlusion protocol group; SHAM, control group without repetitive occlusion; VER, verapamil group; VPS, ventricular premature beats. Seventy rats were randomly allocated to five treatment and two control groups. Treatment group animals received nitroglycerin (NTG group: 17.37 µg nitroglycerin twice daily), ß1-blockers (MET group: metoprolol 190 mg/kg/day), L-type calcium-cannel blockers (VER group: verapamil 22 mg/kg/day), sodium channel blockers (RAN group: ranolazine 62 mg/kg/day) or angiotensin II type 1 receptor blockers (CAN group: candesartan 2 mg/kg/day). Drugs were dissolved in water and applied by oral gavage using a flexible esophageal probe. Control group animals received a placebo treatment of 0.5 mL water once daily for 10 days in parallel with RO (ROP control group) or without RO (SHAM control group). One day after completion of RO and 2 days after termination of treatment, a myocardial infarction was induced in all animals artificially by sustainedLAD occlusion for 90 min. After subsequent reperfusion for 20 min, rats were anaesthetised and sacrificed by CO2. Subsequently, their hearts were eviscerated for structural evaluation (figure 1C). Functional outcome measures were maximal ST-segment elevation and ventricular arrhythmias according to Lown’s grading during the final occlusion. Structural outcome measure was the volume fraction of the infarcted myocardium. Cardiac structural and functional outcomes were considered representative for the extent of collateralisation. ST-segment elevation is considered a quantitative indicator of collateral function.5 6 It is strongly related to infarct size and mortality. Therefore, maximum ST-segment elevation within the first 30 min of final occlusion was determined using LabChart data analysis software (ADInstruments, Oxford, UK). Any pre-existing ST-segment elevation 30 s prior to final occlusion was considered as baseline. Arrhythmias were categorised according to Lown’s grading of ventricular arrhythmia: 0=no ventricular premature beats (VPB), I=unifocal (<30 PVB/hour), II=unifocal and frequent (>1/min or ≥30/hour), IIIb=systematised ventricular extrasystoles (bigeminy), IVa=2 consecutive beats (couplets), IVb =≥3 consecutive beats (salvos), V=R on T. For analysis, categories were allocated to a VPB score, scaled from 1 to 7. Constant location and time of occlusion provided, infarct volume indicates directly the collateral supply.6 11 Volume of the infarcted myocardium was evaluated by 2,3,5-triphenyltetrazolium chloride (TTC) staining as described below. After final sustained LAD occlusion and subsequent reperfusion for 20 min, hearts were perfused with phosphate-buffered saline solution. Thereafter, left ventricles were frozen at −20°C for 10 min and cut in 2 mm sections. Left ventricles were then incubated in TTC solution for 20 min at 37°C and transferred to 4% formalin for 15 min. Infarcted myocardium is TTC negative and therefore becomes visible as pale pink tissue. Images were taken with Canon Super Shot S70 and acquired on a Leica MZ6 microscope. The infarct volume was calculated from the determined infarct area of every section of the sliced left ventricle, multiplied by number and thickness of the sections. Infarct volume was expressed as a percentage from the left ventricle. Continuous variables are reported as mean±SD. Means are presented with their corresponding 95% CIs. Differences between means were compared by Dunett’s multiple comparison. Kruskal-Wallis test was used to compare categorical variables. A two-sided value of p<0.05 indicated statistical significance. Statistical analyses were performed with XLSTAT software V.2015.6.01.24026 (Addinsoft SARL). Maximal ST-elevation during final occlusion was significantly decreased in the ROP and the NTG group compared with SHAM. Rats treated with RO plus metoprolol, verapamil, ranolazine or candesartan did not differ significantly from SHAM but showed an increased ST-elevation compared with the ROP group. However, only the difference between the RAN and the ROP group was significant (figure 2A, table 1). Effect of sustained left anterior descending coronary artery (LAD) occlusion and reperfusion on ECG findings and volume fraction of the infarcted myocardium. Maximal ST-segment elevation (A) and arrhythmias (B) were assessed during 90 min of final occlusion. Differences between means were compared by Dunett’s multiple comparison. Means are pictured as diamonds with their corresponding 95% CIs (A, C). The Kruskall-Wallis test was used to determine whether proportions of arrhythmia grading differed significantly between each group and sham or ROP. (B). Lown’s grading of arrhythmia: 0=no ventricular premature beats (VPB), I=unifocal (<30 PVB/hour), II=unifocal and frequent (>1/min or ≥30/hour), IIIb=systematised ventricular extrasystoles (bigeminy), IVa=2 consecutive beats (couplets), IVb =≥3 consecutive beats (salvos), V=R on T. A value of p<0.05 indicated statistical significance versus ROP* or vs SHAM**. Number of analysed animals is given in table 1. CAN,candesartan group; MET, metoprololgroup; NTG, nitroglycerin group; RAN, ranolazinegroup; ROP, repetitive occlusionprotocol group. None of the treatment groups differed significantly from the SHAM or the ROP group with regard to Lown’s grading of ventricular arrhythmias. However, the ventricular premature beat (VPB) score was lowest in the ROP group. Rats treated with verapamil, ranolazine or candesartan showed a tendency to higher VPB scores (figure 2B, table 1). Percentage of infarcted myocardium by volume was significantly lower in the ROP and the NTG group compared with the SHAM. As with ST-elevation, none of the treatments increased infarct size compared with SHAM. The SHAM, VER, RAN and CAN groups showed larger infarct sizes than the ROP group with significant differences for SHAM, VER and CAN (figure 2C, table 2). In this study on myocardial resistance in a rat model of repetitive coronary artery occlusion, we found that the most frequently used cardioprotective drugs in CAD unfavourably impacted the cardiac outcomes. As expected, the ROP control showed improved functional and structural cardiac outcomes after sustained LAD occlusion and reperfusion compared with the sham control. Presumably, this was due to RO-induced enhanced collateralisation and thus reduced ischaemia. Additionally, RO might have served as preconditioning of reperfusion. After all, reperfusion injury accounts for up to 50% of infarct size in animal models due to oxidative stress, cell swelling, intracellular calcium overload, lactid acid washout and inflammation, all of which mediate cardiomyocyte death.11–15 However, whether repeat episodes of angina in patients with CAD similarly precondition their myocardium remains speculative. 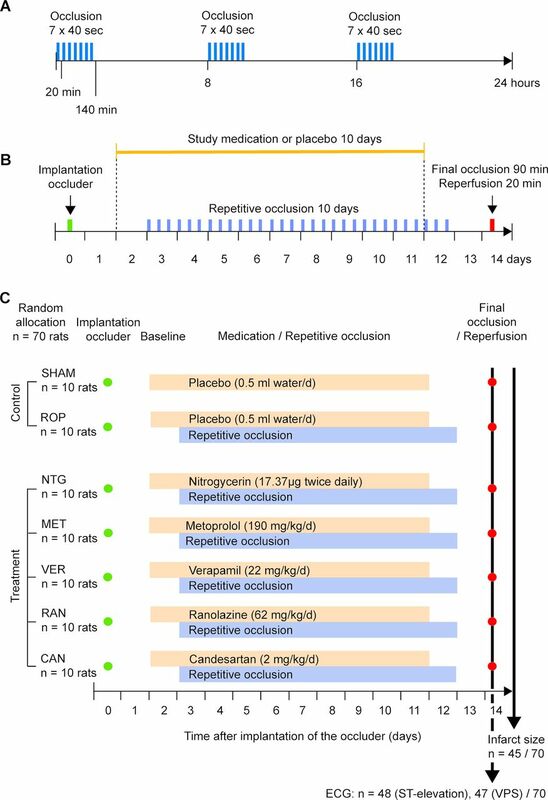 Results after concomitant treatment with metoprolol, verapamil, ranolazine or candesartan did not differ significantly from the sham treatment, which suggests that those medications negatively affected cardioprotective signal cascades. Moreover, results from verapamil, ranolazine and candesartan tended to be worse than those from metoprolol. In contrast, RO plus nitroglycerin medication improved the cardiac outcome similar to RO alone. From this, it can be derived that nitroglycerin did not negatively affect signal transduction and arteriogenesis. Cardioprotection including collateral growth can be achieved by different therapeutic or experimental approaches such as external counterpulsation, endurance exercise training,6 16 administration of vascular growth factors,17 granulocyte colony-stimulating factor18 and blocking of natural inhibitors such as interferon-ß receptors.19 Therefore, one might suspect that even common cardiovascular medications for patients with CAD may affect the balance of promotion and inhibition of cardiac resistance. Nitroglycerin is widely administered for rapid coronary vasodilation. The active metabolite of nitroglycerin, nitric oxide (NO), is also released naturally by endothelial cells as a consequence of increased pulsatile, tangential fluid shear stress (FSS) within collateral vessels in the event of an upstream flow-limiting stenosis. Additionally, NO itself increases the pressure gradient and therefore, the FSS. Thus, NO leads to a flow-mediated vasodilation and additionally facilitates the cascade of vascular remodelling to activate structural modification.7 In this rat model, NO from nitroglycerin medication and naturally released NO from repetitive occlusion might have complemented, but not enhanced one another in their effect on arteriogenesis. Possibly, endogenous NO was already maximally released during RO, analogue to results from administration of nitroglycerin during exercise.20 However, previous studies found an impaired endothelial nitric oxide synthase (NOS) pathway in elderly patients with CAD, which goes along with decreased collateral growth.21 Therefore, nitroglycerin medication in the case of impaired nitric oxide metabolism might be an issue of further research. Calcium-channel blockers (CCBs) are potent vasodilators. In this study, verapamil impaired the arteriogenetic effect of RO. By analogy, Kohro et al found a deleterious effect of CCBs regarding cardiovascular events in patients presenting with myocardial infarction during a 3-year follow-up.30 One possible explanation might be a coronary steal from microvascular vasodilation.31 The blood flow is drained away from the collateral-dependent ischaemic myocardium accompanied by a decreased pressure gradient and FSS within the collateral vessels, which should have triggered arteriogenesis. Ranolazine reduces the intracellular sodium dependent calcium overload during myocardial ischaemia and thereby prevents electrical instability, reduced contractility and increased diastolic tension.32 In patients with CAD, angina frequency and total exercise duration were shown to improve with ranolazine.33 However, ranolazine did not reduce adverse cardiovascular events or the angina frequency after incomplete coronary revascularisation.34 35 In this study, ranolazine plus RO came off worse than RO alone. The underlying mechanism is not yet fully understood. However, calcium entry into vascular endothelial cells is known to activate NOS and there is a functional interaction between endothelial sodium-calcium exchange (NCX) and NOS.36 Calcium influx through reverse mode NCX is required for VEGF signaling.37 From this it can be derived that ranolazine might have impeded the upregulation of NOS and therefore impaired collateralisation. Angiotensin II type1 receptor blockers (ARB) are suspected to improve coronary endothelial function by improving the NO bioavailability.38 However, the renin-angiotensin system (RAS) with its active peptide Angiotensin II is a major determinant in cardiac remodelling and thus, RAS blockade by candesartan attenuates remodelling. Candesartan was found to inhibit the expression of vascular endothelial growth factor and the proliferation of endothelial progenitor cells.39 40 Overall, mode and extent of interaction between ARBs and arteriogenesis, particularly regarding myocardial infarction and cancer, is still controversial. However, the findings from this study of a trend towards worse functional and significantly worse structural outcome with candesartan under the condition of myocardial ischaemia compared with RO alone confirm the existing knowledge. The study design did not include the assessment of the treatment effect of cardiovascular drugs in the absence of RO and, therefore, does not permit any final conclusion concerning the efficacy of the studied drugs regarding cardiac resistance against ischaemia and reperfusion. Moreover, arteriogenesis was only indirectly concluded from functional and structural cardiac outcomes after coronary occlusion, but not from comparative imaging of the coronary microvasculature or blood flow measurement. However, the rationale of this study was in accordance with previous findings from a rat model on repetitive occlusion, which included microvascular imaging and blood flow measurement. Infarct size has been reported as a percentage of the left ventricle, not of the anatomic area of risk. Therefore, variation in vascular anatomy had not been taken into account. In humans, CAD and myocardial infarction is an inflammatory condition, and frequently patients suffer from coexisting diseases, which were both not reflected in this rat model. A sufficiently developed and functioning coronary collateralisation is an important predictor for survival after myocardial infarction in patients with CAD. In this rat model of repetitive myocardial ischaemia, cardiovascular medications turned out to reduce RO-induced myocardial resistance against ischaemia-induced and reperfusion-induced injury, represented by functional and structural cardiac outcome measures. This may have been mainly attributable to a reduced NOS activation by way of a decreased oxygen demand (metoprolol), microvascular vasodilation (verapamil), alteration of endothelial sodium-calcium exchange (ranolazine) or RAS blockade (candesartan). Metoprolol tended to impair cardiac resistance to a less extent, probably, due to its protective, negative inotropic effect. Nitroglycerin did not affect cardiac resistance beyond the level already achieved by repetitive occlusion. However, the experimental setting of this pilot study does not allow for final conclusions regarding the treatment of patients with CAD.
. Na(+)/Ca(2+) exchange facilitates Ca(2+)-dependent activation of endothelial nitric-oxide synthase. J Biol Chem 1999;274:29529–35. Contributors Substantial contributions to the conception or design of the work: NG, NGü, PH, AD, FLN, EEB, IRB; or the acquisition, analysis or interpretation of data for the work: NG, NGü, PH, AD, FLN, EEB, MI, PB, IRB; drafting the work: MI, PB; or revising it critically for important intellectual content: NG, NGü, PH, AD, FLN, EEB, IRB; final approval of the version to be published: all authors; agreement to be accountable for all aspects of the work in ensuring that questions related to the accuracy or integrity of any part of the work are appropriately investigated and resolved: all authors. Funding The study was funded by a grant from the German Cardiac Society, Düsseldorf, Germany. Ethics approval The animal procedures were approved by the Regional Office for Health and Social Affairs Berlin (G 0387/10 and G0040/14) and performed according to the guidelines from Directive 2010/63/EU of the European Parliament on the protection of animals used for scientific purposes and the German Animal Welfare Act as amended on May 2006.